Install Adjusted Matrix on an icebreaker. Host icebreaker gains AI and "You may spend click to break any subroutine on a piece of ice currently being encountered." When can the Runner use the ability gained by Adjusted Matrix? The Runner can use this ability if the host icebreaker meets the strength of the encountered ice. 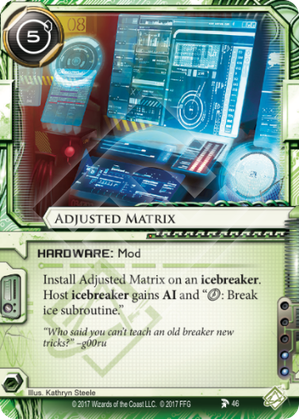 Treat the card as if it said “Host icebreaker gains AI and "You may spend to break any subroutine on a piece of ice currently being encountered." Designer’s Note: Errata for this card will be issued in the next FAQ. What happens if the Runner installs an Adjusted Matrix on an icebreaker hosted on another card with a non-AI icebreaker restriction (such as Dinosaurus)? The icebreaker hosting Adjusted Matrix gains AI, which makes it no longer satisfy the hosting requirement on Dinosaurus. The icebreaker is immediately trashed, then so is the Adjusted Matrix. What happens if the Runner installs an Adjusted Matrix on an icebreaker hosting Dedicated Processor? Similar to Parasite, Dedicated Processor’s restriction is only considered at the time of its installation. If the host icebreaker later gains AI, nothing happens. Probably best with Endless Hunger as it has base 11 strength and can handle etrs. Apex with this and E3 has a way to walk through servers, albeit without the threat of Apocalypse.